The Steel Will Roamer R315-1OR with a 4.5" clip point satin blade and orange TPE handles is an excellent choice for your next camping or hunting trip. The 9Cr18MoV stainless steel clip point blade makes short work of even larger game animals while being corrosion resistant and easy to sharpen. A wide belly lends itself to skinning tasks, while the precise point allows for easy and accurate placement. 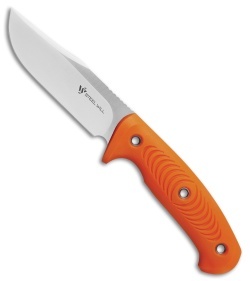 Grooved orange TPE handles are comfortable in hand and provide an excellent grip even when wet. Carry your Roamer into the field with the included black leather belt sheath with dangle loop. 9Cr18MoV stainess steel blade for corrosion resistance and durability. Comfortable grooved orange TPE handles. Durable black leather belt sheath.